Sometimes we’re wrong. We make mistakes. Bad luck happens. In a discipline like investing, built on estimates and probabilities, it can happen often. And yet, being wrong is something people don’t think about very often. The most important lesson – of all the lessons – in The Intelligent Investor, is the concept of margin of safety. This is not a new idea. Engineers use it all time. They build things stronger than needed like a building designed to withstand a mega-earthquake or a bridge designed to hold more weight than it will normally see. You use it when driving a car. It’s the distance between you and the car in front of you. And some people actually use it when they invest. It’s the difference between the real value and the price you pay. A wider margin offers more room for error and less reliance on accuracy. It’s an extra layer of protection from an uncertain future. The margin of safety idea becomes much more evident when we apply it to the field of undervalued or bargain securities. We have here, by definition, a favorable difference between price on one hand and indicated or appraised value on the other. That difference is the safety margin. It is available for adsorbing the effect of miscalculation or worse than average luck. 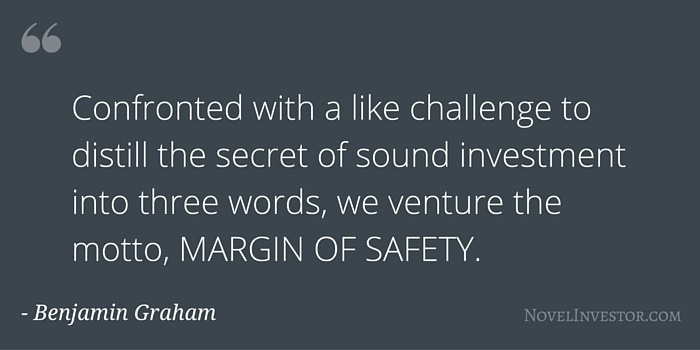 The margin of safety is always dependent on the price paid. It will be large at one price, small at some higher price, nonexistent at some still higher price. Graham believed an investors first goal was protection from losses. One way to do that is to buy at such a low price that even if you screw up, you still make a profit. Now, we all know that won’t happen every time. So a more realistic view is that a margin of safety protects you from big losses while offering better returns when you’re right. And if you combine margin of safety with a basic level of diversification, your increased chance of being right will outweigh the impact of being wrong. Even with the a margin in the investor’s favor, an individual security may work out badly. For the margin guarantees only that he has a better chance for profit than for loss – not that loss is impossible. But as the number of such commitments is increased the more certain does it become that the aggregate of the profits exceed the aggregate of the losses. If it sounds like common sense, that’s because it is. Paying less than something is worth, by an adequate margin of safety, gives you the best chance to make money over time. This is why price always matters. Every asset can be a good or bad investment simply based on price.